Our tale today tells of the death of Francesco Geminiani, an Italian violinist and composer. Nicknamed, Il Furibondo (the madman) by his pupils due to his all-consuming methods of composition and performance, his enormously successful career ended on a sad note during a trip to Ireland. Geminiani enjoyed the support of numerous most illustrious patrons in Europe and travelled the continent assuming high profile positions and sharing his skills with pupils who often went onto celebrated careers of their own. He wrote books on the theory of violin playing and composition, and composed for that instrument in addition to others. 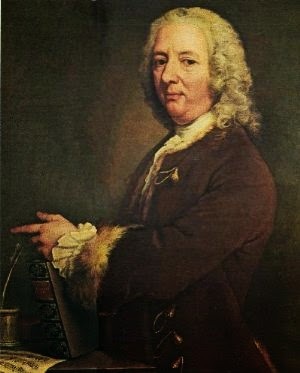 As suggested by his nickname, Geminiani was devoted to music to the point of obsession. He would spend long hours labouring over his work, seeking perfection in every endeavour and he taught his pupils the importance of striving for perfection.He moved to Dublin in 1760 and spent his time working on an exhaustive book of musical theory, devoting many, many hours to this new manual and pouring himself into it tirelessly. Disaster struck when a domestic servant, in the pay of an unknown party, stole the manuscript whilst in Dublin and made so good her escape that the book was never recovered. Geminiani sank into an unhappy decline from which he did not recover and he died a broken man in 1762, unable to mentally deal with the loss of his life's masterwork. I think you may have a really interesting point there; obsession seems to have been an ongoing issue in the 18th century musical world! Poor man. His music is ravishing. I can't imagine how devastating the loss must have been.